Following on from yesterday's post, just for fun I adjusted my model to the original Victorian condition of the house by removing all insulation and the vinyl siding from the model. I then guesstimated that without the exterior storm windows, no weatherstripping, and no vinyl siding (so air could sneak in between the clapboards), the blower door would have pulled 8000cfm. I then contrasted that in the graph above with my estimate of the present energy losses of the house (expressed in millions of BTU per heating season), and with the condition after my estimates of Snug Planet's proposed project. I now have an estimated blower door target from them of 2500cfm so I put that in rather than yesterday's 1800cfm. Finally, in response to yesterday's post, several commenters suggested adding tight-fitting seasonal interior storm windows to the existing windows. Assuming that raises the window R value to 3 and cuts the remaining infiltration to 1200cfm @50Pa, that gives me the fourth stack in the graph. Previous owners were rational in the things they did - they tackled the lowest hanging fruit and the house is much more efficient as a result. What Snug Planet wants to do is also rational and would be a large and clear improvement and probably does represent the next set of lowest hanging fruit. However, it seems like adding some kind of interior storm windows is intriguing and I want to explore the feasibility and cost-effectiveness of that. 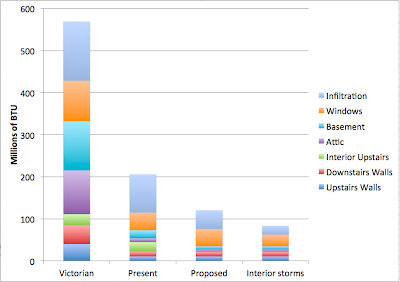 Update: On reflection, the Victorian bar likely overstates actual energy use in that era since they almost certainly kept most of the home a lot colder. That much heat would require 22 cords of wood in a 65% efficiency stove. Probably the house was miserably cold in the winter and they all huddled round the stove. Does this house have an existing rodent problem? Would be interesting to know if the extra efforts at sealing it also excluded more than just cold air. I would add also, you might want to redo the radon test after sealing (I saw the comment on the previous post). You have an essentially constant supply from below, diluted by the house's air exchange. Cut the air exchange, the concentration should go up. Thanks for your blogging efforts. 1.) You will experience jevon´s paradox. Your wife will like it warmer and cuddlier than before the improvements. 2.) Interior storm windows are problematic, because water vapor condenses on surfaces cooler than 12 degrees centigrade. In the long run this will result in mold on the outer window frames. "Probably the house was miserably cold in the winter and they all huddled round the stove." Most likely, they had several stoves, and probably did use 8-12 cords of wood a winter. They almost certainly cooked on a woodstove in the kitchen, had a stove in the center of the ground floor, and maybe one upstairs somewhere too. They probably managed to heat the place to 60F or so during the day, and wore enough clothes to be comfortable. But not much in the way of hot water! But compare that with the Iroquois who lived there before them. The folks who built your house probably thought they were blessed compared to getting through the winter in a longhouse. We've all gotten pretty soft since then.